We have teamed up with ZirkOps Training and offer more classes than any other store around. We have great trainers for shooting, self defense, tactical shooting with all kinds of guns, & cleaning classes. If you need to learn it, we have a class to teach it. We also have a physical trainer on site to help with any physical training needs. It has been a great partnership to bring more to our customers. 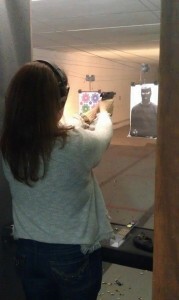 As a female I never thought I would ever get a carry permit, but decided to take the class at Carters. I had the best instructor ever. I now have sent several people there. Carters Shooting Supply is the best place ever. Women if I can do it so can you! I was in the carry permit class today. Kristi is such a fantastic instructor! She keeps you engaged in the classroom and makes it FUN! I highly recommend taking your classes at Carter’s. I also bought my gun there. The guys were very helpful with helping me pick out the gun that felt comfortable to me. They allowed me to shoot a couple different recommended guns before making my final selection. It is a GREAT family owned establishment. Customer service and attitude is everything for me…and they got it all! Love their handgun class. Explains things very well. If you listen should ace it. The permit class was great along with the friendliness of the entire staff. If you want to be treated as a person come to Carters. WE HAVE GIFT CERTIFICATES THAT CAN BE PURCHASED FOR CLASSES AND THAT MAKES A GREAT PRESENT! ASK US HOW TO GET YOUR HANDGUN CLASS FOR FREE!